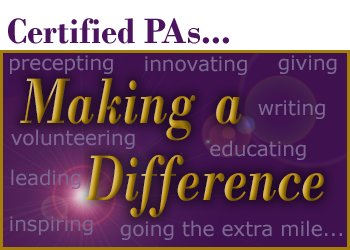 As we all prepare for the 50th anniversary of the PA profession in 2017, we want you to help us identify “50 PAs who are making a difference today.” NCCPA and the nccPA Health Foundation will profile those PAs online during 50 weeks of celebration in 2017, recognizing them as examples of the many ways Certified PAs are demonstrating that when it comes to high quality health care, promoting wellness, saving and changing lives… #PAsDoThat! In next month’s NCCPA News, we will provide more details on how to submit a nomination. In the meantime, give some thought to PAs you know who embody the best of what the PA profession is all about. Earlier this month we provided an update on our consideration of potential changes to PANRE, reflecting feedback received during the public comment period. If you missed it, read the announcement online. Last month, we announced that PI-CME and self-assessment CME are no longer required but will be weighted more heavily, reflecting the value of these very interactive types of CME. We just want to remind you that it will take several months to complete the reprogramming and redesign of the certification dashboard and logging system to reflect these changes. In the meantime, please continue to log these activities as you normally would, reporting the number of credits awarded by the CME provider. Once complete, the weighting will be applied retroactively to all approved self-assessment and PI-CME activities previously logged; then when new self-assessment or PI-CME activities are logged, the weighting will be automatically applied by NCCPA. Questions about this? Read the Q&A posted on our website. At its Board meeting last month, the nccPA Health Foundation selected Cynthia Bunde, MPAS, PA-C, and the Pocatello Free Clinic as the inaugural recipient of the Kathy J. Pedersen Grant to Promote Equitable Care. Bunde’s proposal, “Texting for Mental Health: A Case Management Approach in the Free Clinic Setting,” pilots an innovative program that uses text messaging as the basis for case management for uninsured patients with mental health diagnoses. In addition to directly benefiting patients participating in the program, the 30-week pilot will assess the potential to extend a PA’s ability to reach a greater number of patients through diverse access points. Results from the pilot program will be shared in 2017. The next funding cycle for the Kathy J. Pedersen Grant to Promote Equitable Care will open in the Spring of 2017. Watch the NCCPA News for the call for proposals and begin designing your project to foster equitable care by addressing a need in your community. Don’t want to wait until 2017? The nccPA Health Foundation’s Be the CHANGE grant, which provides up to $1,000 for projects that create health access now for greater equity is available year-round while funding remains. Review the grant guidelines and submit your application to make a change in your community. The Kathy J. Pedersen Grant to Promote Equitable Care is made possible by a generous donation to the nccPA Health Foundation from PAs Don and Kathy Pedersen. In August, 18 PA champions participated with interprofessional partners from medicine, dentistry, public health, and philanthropy in the 7th PA Oral Health Leadership Summit in San Jose, California. This year’s Summit included a focus on practice and system transformation following the publication of a Qualis Health white paper, Oral Health: An Essential Component of Primary Care, which describes a care delivery framework composed of five activities already taking place in PA practice. Participants brainstormed strategies to further equip clinically-practicing PAs to recognize the oral-systemic connection and to embrace oral health as the low hanging fruit of prevention. Leaders from the national PA organizations also shared strategies each organization has implemented to support integration of oral health within their respective spheres of influence, including CME activities for clinically-practicing PAs and educators, interprofessional videos and grant opportunities for those seeking to integrate oral health in curriculum, outreach, or practice. The PA Leadership Initiative in Oral Health is supported by the National Interprofessional Initiative on Oral Health (NIIOH) with funding from the DentaQuest Foundation and Washington Dental Service Foundation. Approximately 1 in 5 adults in the US – 43.8 million people – experiences a mental illness in a given year. That staggering number is all the more compelling as the Health Resources and Services Administration reports that 99.5 million Americans live in mental health profession shortage areas. Share tools and resources that you use to promote mental health in your practice. Watch for more information as our efforts get underway! Tax deductible donations can be mailed to: PA History Society, 12000 Findley Road, Suite 160, Johns Creek, Georgia 30097. Please mark “Garden” for a general monetary donation, or “Paver” on the memo line of your check. Credit card payments for general donations (non-brick paver orders) are accepted via the PAHx website here. Please mark “Garden” next to your name. 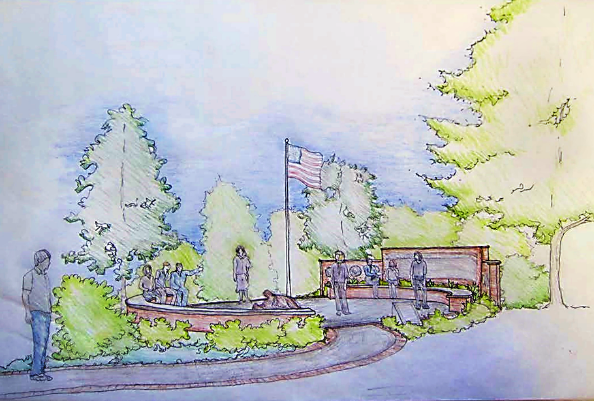 The History Society continues to raise funds for the Veterans Memorial Garden, a site that honors the contributions made by former and current military PAs to the PA profession. In addition to accepting general monetary donations, the Society has also established a “buy an engraved paver” program with the Bricks R Us Company. The tax deductible 9x9 inch brick pavers, which honor PA veterans and PAs on active duty in the Uniformed Services, can be purchased online here. The engraved paver will include the appropriate uniformed service logo and 3 lines for name, branch and years of service. The engraved brick pavers will be embedded in the wheelchair accessible walkway and the patio surrounding the centerpiece of the garden, the life-size bronze combat medic statue and flagpole. The pavers are a great way for PAs to honor their PA veteran colleagues, especially those who are no longer with us. Please consider making a donation in honor of the veterans who are honored by this garden. For more information about this project, please visit our website, or write to us at contactus@pahx.org. If you haven't already done so, be sure to "like" PA History Society on Facebook to receive updates and follow us on Twitter. Sarah Cawley, PA-C, draws on personal experience in her blog “Being a Patient Makes Us Better Providers,” recently published in Physicians Practice. In Physician’s Money Digest, Dawn Morton-Rias, Ed.D., PA-C, explains how PAs Add Value, Enhance Revenue. The article also quotes Dr. Anil Ranawat, orthopedic surgeon at Hospital for Special Surgery in NY, about the significant contribution of PAs in that specialty. In Crumbling Boundaries Between Patients and Doctors, an editor for Physicians Practice interviews certified PA Barb Malat, along with a physician and an administrator, for tips on how to deal with patients who overstep their bounds. Be the Change grant recipient Wendy Carazo and her UTMB PA classmates created a Superhero Hideout for patients at the Ronald McDonald House in their community. Learn more and watch (1:14) a time-lapse video of their efforts that were supported by the nccPA Health Foundation. Let Your Patients Brag About You! Do you have patients willing to give a brief testimonial about how you have made a difference in their life? Ask them call 678-417-8178 and leave a message telling us about it. We will post that audio file on our “PAs Do That” website. You can visit http://pasdothat.net/Listen to hear examples of other patients who love their PA. Physicians can call in, too! Help spread the word about all the good work you do.